As homeowners move away from bathtubs to more streamlined showers in their washrooms, the importance of a proper shower door can make all the difference in the space. According to NorthJersey.com, there are a few determining factors you should look out for to help your door conform to the parameters of your room. If you're using a corner shower stall, you'll have to decide whether the door will open from the left or right. For instance, if you have a bathroom vanity or a toilet on either side of the shower stall, you should try a few designs to implement a door that won't inhibit traffic flow. The difference between a framed and semi-framed door will also make a difference in the price. 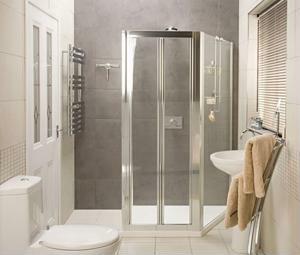 Framed doors install directly into a shower stall and are the cost-effective option, while semi-framed doors are typically custom-made to suit a unique stall. Clear glass is typically the most popular finish, and it can help to visually improve the size of the space. Lastly, with the absence of a shower curtain, be sure to utilize additional linens and window treatments to infuse the space with a pop of color. What are the selling points you look for in a shower stall door?